Dr. Myles Williams was born and raised in Georgia. He graduated from The University of Georgia in 1991 with a Bachelor of Arts prior to earning his DDS from West Virginia University in 1995. Dr. Williams is a proud member of the Academy of General Dentistry, the Academy of General Dentistry and is a Premier Preferred Provider of Invisalign and is a Premier Preferred Provider of Invisalign. 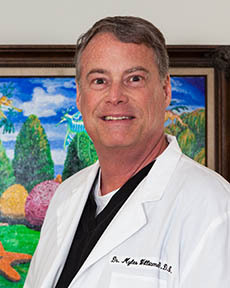 Aside from dentistry, he is a professional artist and has won numerous awards for his work. Additionally, he is an accomplished musician and has been playing guitar and piano, as well as singing since he was a child. He has a beautiful wife, Katrina, and two wonderful children, Katie and Luke. He looks forward to providing you and your family the highest quality dentistry with a warm, friendly attitude.